Hinky Dinky Saturday Night #11, March 3rd 2011 – Hinky Dinky Parlay Voo? 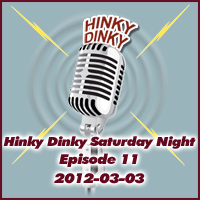 Hinky Dinky Saturday Night – Episode 11: Saturday, March 3, 2012. Join me for three hours of music, including an all-vinyl second hour!